In an industry where products often change like fashion, Marconi has defied obsolescence, remaining relevant for more than 15 years and becoming a High End classic. 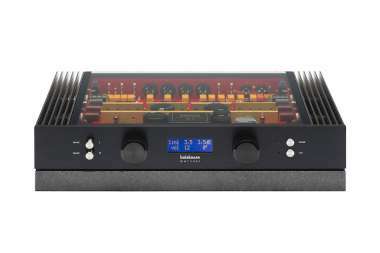 Now, Brinkmann proudly announces Marconi Mk II, destined to define a new standard of sonic excellence. Although the line preamplifier is easily taken for granted, its three jobs — input selection, volume control and the ability to drive any cable and amplifier load — are essential to proper system performance. Fulfilling these functions without signal loss or influence upon musical integrity constitutes one of the greatest challenges in electronics design. As expected, Brinkmann didn‘t accept any compromises when developing Marconi. Our volume control, for instance, is purely electronic and works on two levels. First, the sensitivity or “Trim” of each of the six inputs can be adjusted individually and saved, thus eliminating the disturbing jumps in volume when switching between sources. Second, the “Master” volume control consists of a motorized potentiometer that can be operated either remotely or from the front panel. This potentiometer digitally controls ICs which in turn adjust the playback volume passively with discrete resistors in precise steps of 0.5 dB. Immunity from noise can only be achieved with balanced signal processing. For a stereo preamp, four complete amplifiers—two per channel—are required, as the signal is processed both In-phase and Inverted. Since non-musical artifacts (i.e., noise) influence the in- and out-of-phase signals to precisely the same degree (known as “Common-Mode Noise”) they can be eliminated at the input of the amplifier because the inverting and non-inverting signals cancel each other. This ability to cancel noise (known as “Common-Mode Rejection”) justifies, in our opinion, the doubled parts count and complexity of the circuit. We use a vacuum tube phase inverter stage because tubes operate with virtually zero voltage delay, delivering an inverted signal that is a perfect mirror image of its non-inverted counterpart: essential for Common-Mode Rejection. The tubes reside in two oversized, side-mounted heat sinks, ensuring ideal operating temperature and long tube life. The remote handset facilitates input selection, volume control (including mute) and phase inversion. A comprehensive front panel display provides Input, Volume and Phase status. Since the development of the original Marconi, Brinkmann Audio’s unique hybrid circuit, employing bipolar transistors and Telefunken NOS tubes, has evolved, reaching its full potential in our latest designs: the Edison Mk II Phono Preamplifier and Nyquist Mk II Streaming DAC. These advancements have now been implemented in Marconi Mk II. This circuit, employed as the output in Edison and Nyquist, has been adapted for use as the input circuit in Marconi Mk II. Marconi’s traditional strengths are now augmented by lower noise, a more detailed and three-dimensional presentation, greater clarity, improved synergy with soft-sounding systems and increased tube life. The “Mk II” redesign required two completely new Printed Circuit Boards; more importantly, hundreds of hours of painstaking fine-tuning by Helmut Brinkmann have yielded an instrument that communicates music with greater realism, enabling—in the best Brinkmann tradition— closer connection between system and listener. Marconi Mk II will ship Q4-2018.